If you are selling on Shopify then search engines are the gateway to reach your future customers who are actively looking for your product or service. Now, when we talk about search engines, Google is the first name comes to our mind. 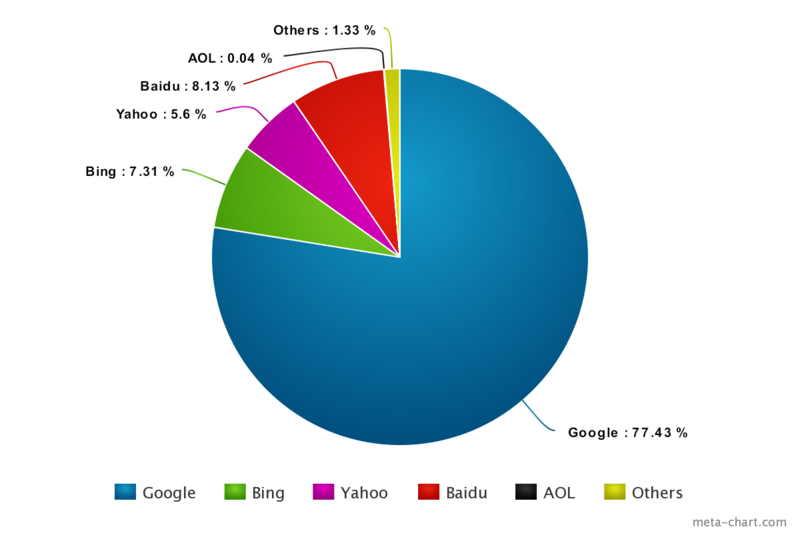 According to NetMarketshare Google holds around 77% of the total search traffic worldwide! Maybe you are also betting on social media or paid advertisements for traffic, but the problem with these sources is that you have to put money and effort to maintain the traffic flow continuously. On the other hand, once your Shopify store pages start showing up in search results you just need to maintain the ranks, and you will have a continuous flow of traffic. Now if you are running a Shopify store but your store’s pages are not being indexed on Google or you can’t see them anywhere in first 2-3 pages for the target keywords, then your Shopify business is literally in great danger. Once your store is live on a domain, the first thing you should do is to submit your website to Google. i) First, you need to create an account in Google Webmaster and then Add and verify your website (your Shopify store). ii) Once you have verified your Shopify store, go to the Crawl > Sitemaps on the dashboard as shown below and submit your sitemap. If your store URL is https://example.com/ then the sitemap URL will be https://example.com/**sitemap.xml **. Here’s a detailed step by step guide on how to submit your Shopify store and sitemap on Google. What happens when you do these? When you submit your store and the sitemap, it helps Google to crawl your website to understand it’s structure, content and index your site accordingly. It’ usually takes 2-3 days for Google to start crawling your website. Check your webmaster account at intervals for the reports. Also, don’t forget to submit your store to Bing webmaster as well to index your Shopify store on Bing, Yahoo and AOL search. 2. Your store’s pages are not optimized for the target keywords. For every unique page of your Shopify store, you must have a list of keywords for which you want your page to rank. It’s always better to target a long tail keyword or a tightly knit group of keywords for a specific page. I will suggest that you start with the Home page, then work on the collection pages and then focus on product and other pages. i)** The URL of the page:** URL is a very important factor for SEO. Make sure the URL of the page is not too long and it contains the most important keywords. ii) The SEO title: This is what people will see on a search engine result page and will click on. Make sure the title doesn’t only contain keywords but also motivates the visitors to click the link on it on the search result page. CTR (click through rate) is an important factor for Google ranking. iii) **Meta descriptions: **Write unique meta descriptions for each of the pages of your Shopify store. Here’s a detailed guide on how to craft an exceptional Title and Meta description for your store. It’s a bit difficult to put SEO titles and Meta descriptions for product pages when you have a lot of products in your store. Here comes the Kudobuzz SEO Shopify app to your rescue. In its all-in-one SEO dashboard, you can easily** manage the titles and meta descriptions in one place** for all your product pages. ****With Kudobuzz SEO, you can set the target keywords for each of your products. Then the app will analyze your title meta descriptions along with the competitor’s pages which are ranking for your target keywords and will suggest improvements accordingly. iv) **Headings on the pages: **Headings such as H1 and H2 helps Google understand the page content better. Usually, the name of the collection/product/page is H1 heading for the page. It’s always great to have the main keyword in the collection/product/page title. v) ALT texts of images: ALT text is another very important SEO component for an ecommerce store. Search engines don’t understand images until you describe it in texts. That’s why you need to put ALT texts for all of the images (especially product images) on your store. Putting ALT text helps your product images showing up in Google search. For ALT texts also it’s much easier by using our Kudobuzz SEO app. In the dashboard, you can see how many of the images are missing ALT texts and further add ALT texts to those images. You can also edit ALT texts of all the images in your store. v) **Page content: **Use your keywords wisely in the descriptions on the pages. For product pages, craft product descriptions with the keywords in it. **Note: **For any of the fields above, don’t stuff it with keywords. Use keywords in a way that blends organically. Duplicate content is one sin that really hurts SEO. Make sure that all the titles, meta descriptions and page content are unique for each page. Use tools like SEMrush to check your Shopify store for duplicate contents. Google is continuously increasing their focus on user experience as a ranking factor. The first thing which can break a good user’s experience is the high page loading time and that’s why Google doesn’t like slow websites. Optimize your Shopify store speed to reduce the loading time. Google has recently announced it’s mobile first indexing project and it means Google will prefer the websites with better mobile experience to rank websites. Make sure your Shopify store is well optimized for use on mobile devices. If you are having trouble indexing your store. Comment below with your store URL and we will love to have a look and suggest you some probable solutions.